Olympia Provisions – Overworked. Underfed. 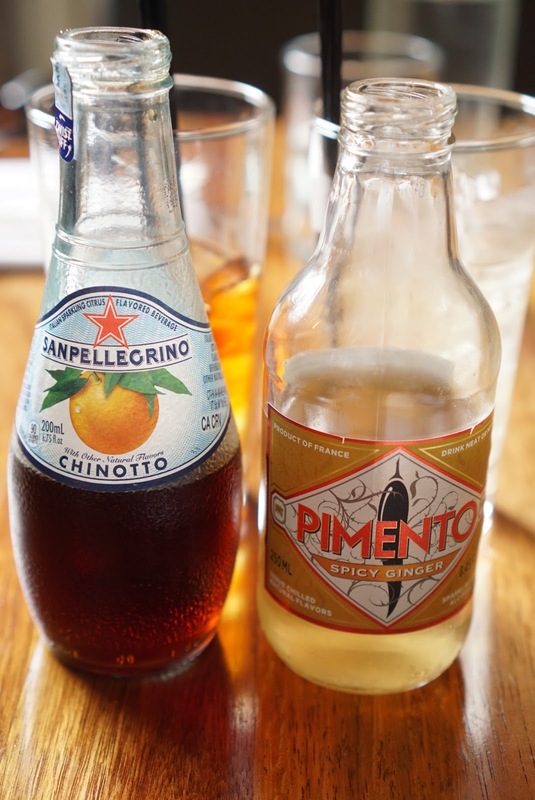 My first visit to Olympia Provisions was 4 years ago, at a time when it was still known as Olympic Provisions (please refer to this link for the utterly ridiculous drama surrounding its name change). But despite the name change, the place still remains the meat/charcuterie/savory centric dining destination that I’ve always been meaning to revisit. I mean, how can you NOT come back to a place that welcomes you with this type of signage. I was a bit disappointed that Zhu Zhu Hamster and Little Pet didn’t join Decidedly Undecided and me for brunch. Sure I tried to lay down a guilt trip like I missed their company, but really I wanted a bigger dining party so I could order and try more food. Alas, between just two people, we could not do much damage. I’m totally on this ginger beer kick, but this was just ok. So like I said, Olympia Provisions serves a more savory brunch. You won’t find french toast and sticky buns here. Rather, you’ll find a range of sandwiches and egg and meat centric items. Aside from the pickles, this dish was pretty protein focused. It was light and to the point. Personally, I probably would have been hungry for more, but Decidedly Undecided was pleased with her choice. 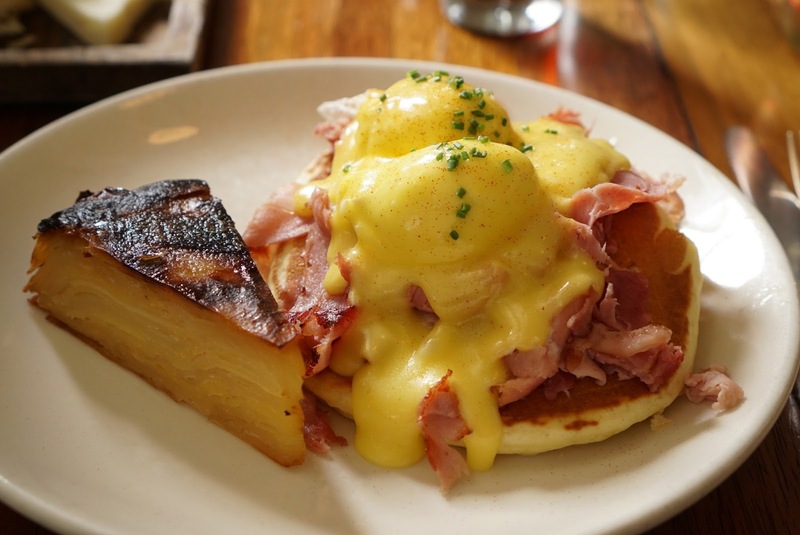 The Benedicts hot cakes, sweetheart ham, poached eggs, hollandaise, potatoesSo my choice had it all. I swapped out the traditional English muffin for pancakes. Oh they were so light, fluffy, and not sweet. I missed that bit of sweetness, so asked for a side of maple syrup. I actually loved the contrast of salty hollandaise and sweet syrup. The perfectly running yolks added a luscious richness. That pie slice looking thing was like a potato pavé, so layers of thinly sliced potatoes baked up with plenty of butter. It was a definitely a break from the traditional hash browns or breakfast potatoes. There was some odd flavor there that I couldn’t pin point, that made me want some crispy hash browns. While my sampling of the brunch items at Olympia Provisions was limited, no thanks to sleepyheads Zhu Zhu Hamster and Little Pet, I can assure you I would love to come back. I do prefer more savory brunch items, which they boast here. 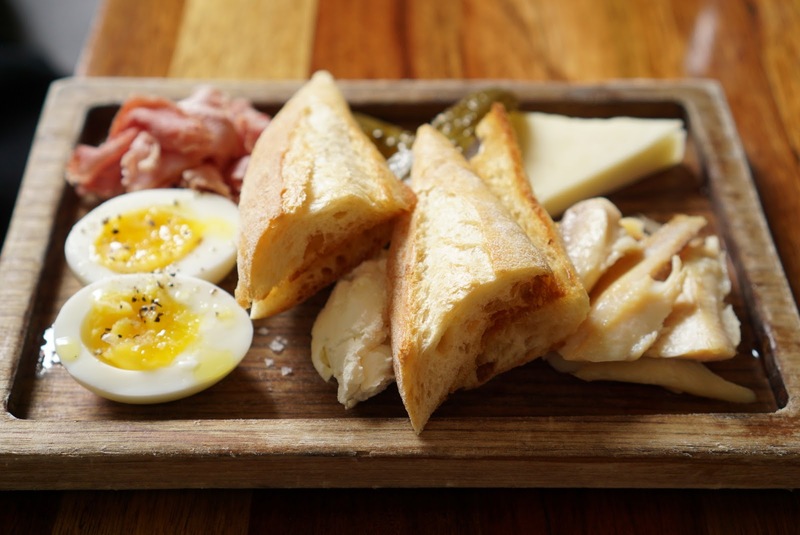 Their dinner menu is also a strong showing of meaty, charcuterie heavy foods. 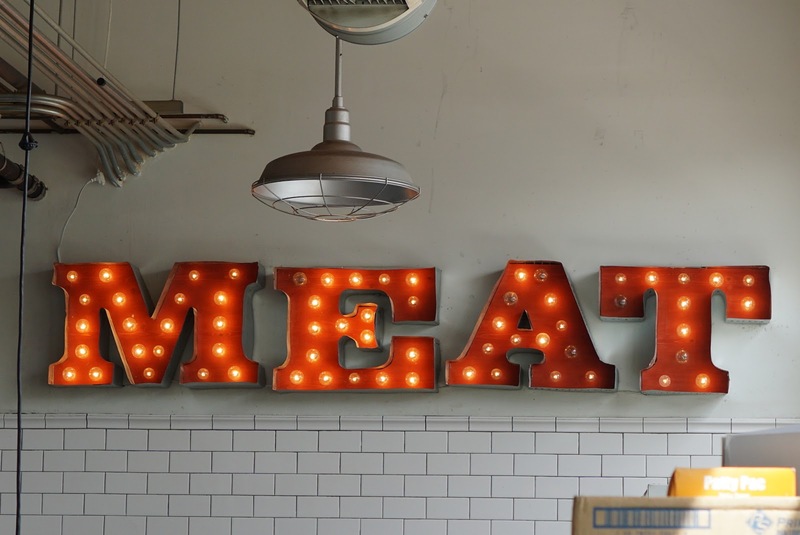 Let’s just say they had me at the “MEAT” sign.